Heidi Doll. Made in Hong Kong. When I lifted up her hair to check for a maker’s mark, I got all excited because I saw an embossed stamp. Then, using a loop, I saw it said “Hong Kong”. Not quite so special. 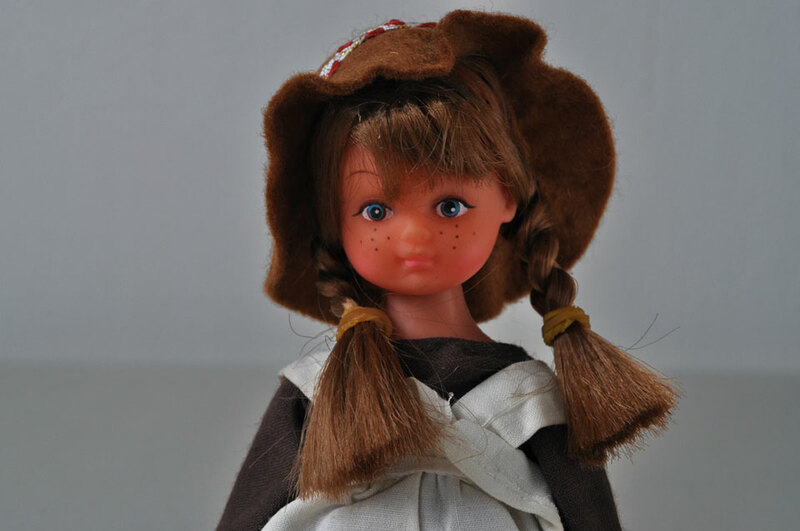 There are currently 807 vintage Heidi dolls on eBay. She is also dressed modestly, with knickers and a slip. Her legs are articulated, so she can be bent to sit down, but she doesn’t really stand up on her own. Her body is plastic, and her face is a softer, squishier type of plastic. Hand painted, someone paid special attention to the eyes. You can probably see the detail if you click the image below. She’s almost ridiculously sweet. I love her little braids with the elastics around them. Status: Now this one I have had untangled from the mess of dolls and put aside in her own tissue paper, waiting to be given as a gift to a friend’s daughter. Problem is that was 2-3 years ago. Now perhaps this kid is borderline too old. 17. Just kidding. I think she is 7. So this should re-gain its status as gift . Before she reaches 17. But first I have to take close up photos of her hands. There are ridges for her fingers that make them look a bit odd, definitely contrasting with her sweet face. Reason # 3 I believe I am at for justifying the purchase of a macro lens. Back view – compelling. Apron detail nice and the under-dressing. Wow…you are bringing back memories of my doll collection. I had one similar to this. I am not sure if any of mine have survived. Even if you do give away some of these items now you have a photographic memory.